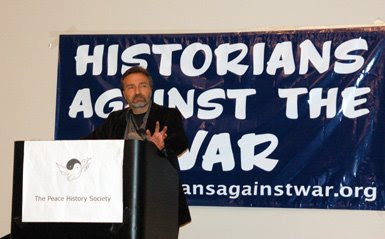 Yesterday and today, I was able to drop by the Historians Against the War conference, ambitiously titled War And Its Discontents: Understanding Iraq And The U.S. Empire. I didn't get to go to much of it, but the bits I saw were encouraging, if -- or perhaps because -- earnest and low key. Samir Moukaddam (AFSC), Shelini Harris (Guilford College), Yael Simpson Fletcher (Agnes Scott College), and Janeieve Williams Comrie (US Human Rights Network) spoke on the topic "Making peace in the war zones of empire: peace activisms of the Third World and Global South." Judy Yi shared a report of police brutality against an aged Asian man, prominent in his community and 30 years a U.S. resident -- and how his community struggled to share their outrage while fearing to bring down further trouble if they publicly proclaimed their distress over the treatment he'd recieved. 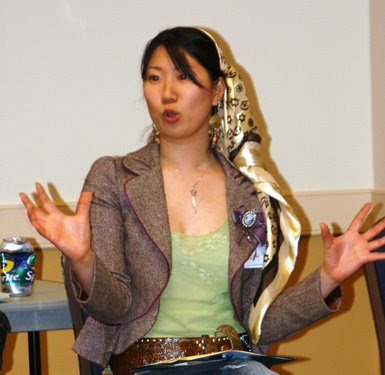 She told the story as an example of how raw survival issues preoccupy the Asian and South Asian immigrants she works with at Pan Asian Community Service (CPACS) in Doraville, GA. The Saturday evening plenary sessions were much appreciated by all I talked with because, in the words of one participant, they featured "people who were real experts who knew what they were talking about. This wasn't just theory." Zachary Lockman from New York University gave us a clear, useable history of U.S. involvement in the Middle East since World War II. Dina Rizk Khoury from George Washington University reminded us of Iraq's nearly thirty years of continuous wars: against Iran from 1980-88; the Gulf War that overturned Saddam Hussein's seizure of Kuwait in 1990-91 and was followed by internal uprisings; and then the U.S. sponsored United Nations sanctions regime that lasted until the 2003 U.S. invasion and occupation. She maintained that the first war, though extremely unpopular, was a nationalist experience. But that the subsequent violence, especially the sanctions regime, so weakened Ba'ath rule that this fascist dictatorship encouraged sectarian and tribal divisions while it remained in power. When the U.S. overthrew Saddam and in general trashed the structures of government and the military that had enforced social cohesion, the divisions previously fostered by the dictator broke loose to create the current chaos. She describes present day Iraq as a warlord society ruled without security by competing militias. Meanwhile 4-5 million Iraqis including most of the Westernized, educated middle class have become refugees. This morning I took part in a panel titled "Learn from History or Repeat It? 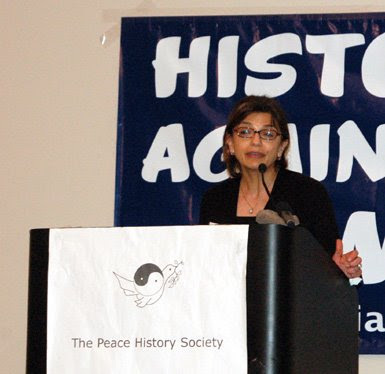 Challenges of a 21st Century Antiwar Movement." The others were peace organizer Christina Repoley of AFSC-Georgia, historian Carolyn (Rusty) Eisenberg, and Max Elbaum, like me identified with WarTimes/Tiempo de Guerras. We had a good conversation among ourselves and with the small audience. No one will be surprised to learn that we think the peace movement has a lot of arduous base-building work to do to rein in our bellicose rulers. In the next week or so, I'll be putting up sections of the paper that I was inspired to write while contemplating speaking on this panel. Cold feet in the Hindu Kush? View out my window: Manchester, N.H.